Three-part series explores UI/UX, Workflows, and Reporting in SharePoint and Office 365. Benicia, CA: Crow Canyon will demonstrate how to ‘power up’ business applications for SharePoint and Office 365 in a free three-part webinar series this fall. Covering three important areas of concern — UI/UX, Workflows, and Reporting — these webinars will provide guidance on how to build solutions in SharePoint and Office 365 that address user adoption issues, improve business processes, and provide important analytics that guide continual improvement. 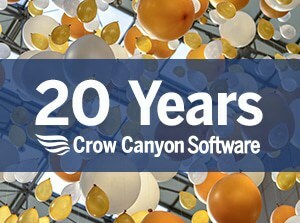 Whether searching for solutions to streamline business processes or looking to do more with SharePoint or Office 365, attendees will benefit from this series as Crow Canyon explores ways to ‘power up’ SharePoint and Office 365 applications to meet real business needs. ●	Session 3: Reporting: Good Data = Good Decisions – Thursday, November 3, 2016.